How do you create characters that people care about? BioShock creator Ken Levine spends a lot of time thinking about that question. He also spends a lot of time thinking about ways to answer that question through video games, a medium that he says has yet to quite master the art of empathy. Perhaps that's why narrative takes center-stage in BioShock Infinite, the highly-anticipated shooter that Levine and his team at Irrational Games will release this October for Xbox 360, PlayStation 3, and PC. It will tell the story of an ex-Pinkerton agent named Booker DeWitt who enters the floating city of Columbia in order to rescue an imprisoned girl named Elizabeth. The core of Infinite's story, Levine says, is the way in which those two heroes affect one another. "Stories are about people going through changes," Levine told me in a phone interview last week. "That's what makes a story." Where Booker is jaded and cynical, Elizabeth is innocent and carefree, Levine explains. As they work together to escape Columbia, which is facing an "incredible upheaval," the two unlikely partners will go through some drastic evolution. "Booker and Elizabeth meet and they're sort of very much opposites," Levine said. "When Booker encounters Elizabeth and has the experience of being with this person who has not been jaded by the world, not become cynical, that changes him and his opinion of himself. "They change each other in very profound ways. Their experience changes them in very profound ways." "I think if you go through the game and the player doesn't feel a connection to Elizabeth, I think we failed." 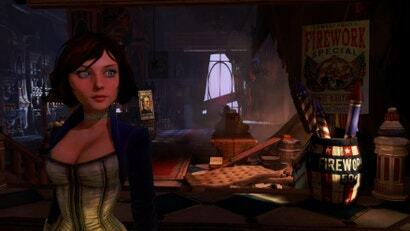 Your eyes are Booker's eyes in the first-person BioShock: Infinite. Your avatar is also a character with his own voice, personality, and character traits. This is certainly a departure from Levine's last project, the first BioShock, in which your protagonist was speechless and faceless, a canvas on which you could project your own feelings. So how does a game writer strike balance between a character's personality and his human controller's? "You have to be respectful, I think, of the player," Levine said, "and making sure — this is always challenging — but you have to make sure that the character is not dictating to the player. "There's always that tension between the player and the character," Levine said. "I'm learning every day. It's something to think about every day. How do you walk the line — how do you give Booker a character but how do you make that character sort of not stopping the player's intention?" Levine says one of the team's most important goals is not just to create a relationship between Booker and Elizabeth, but to make the player feel as if he or she is just as integral to their partnership as they are. "I think if you go through the game and the player doesn't feel a connection to Elizabeth, I think we failed," Levine said. "That's one of the key missions of this game." He says the trick is making her story relatable, realistic, and human. No matter how outlandish their circumstances may be, Levine says, characters can be made compelling if we as an audience can relate to them. "How often do you feel anything about a video game character?" Levine asks. Although he compliments games like Portal and Half-Life for achieving that sense of empathy, the Irrational chief says it's a rare thing in this industry. "I just want you to have some sense of 'I get what she's going through,'" he said. "I think her story, the story of someone who's locked up for her childhood and sort of gets out, and is free, and able to control her own destiny, is an interesting, very universal story. Of course it's set in this crazy world with all these crazy powers, and she's got insane powers, so it's heightened. But I think — like all great sci-fi stories or fantasy stories — it's rooted in something very real." As for Booker and Elizabeth? Levine says they'll spend the majority of the game together, though he won't give us many details about their journey, their growth, or what they'll encounter. He wants to keep the experience spoiler-free. Which means he can be a serious tease. "I think they're gonna end up in some very surprising places," he said.